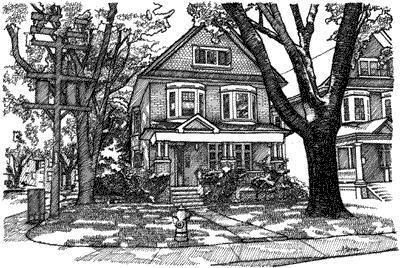 Playter Estates - Royal LePage Real Estate Services Ltd.
Playter Estates is named after the Playter family who held the original land grants on both sides of the Don River near Bloor Street. Captain George Playter, the patriarch of the family, was an United Empire Loyalist who emigrated to Canada from Pennsylvania in the 1790's. George's son James Playter, owned the land where Playter Estates is today. However, it was James' eldest brother John who actually settled on this land. John's grandson, John Lea Playter, erected the Playter Homestead at 28 Playter Crescent in the mid 1870's. This charming brick home is still owned by members of the Playter family. The property around the homestead was used for farmland up until 1912, when the current neighbourhood was developed.